The Lodge began with request from the borough residents to consider establishing an Elk’s Lodge in Middlesex. A meeting was held by the new Lodges Committee of the State of New Jersey Elks on December 2, 1963. Rapid expansion and membership resulted in the election of temporary officers on February 13, 1964. These officers were Joseph Hoski, Chairman; C. Bernard McMenamin, Secretary; Jasper J. Correnti, Treasurer; Winston C. Kee, Membership; William Lewis, House and Walter Rafferty, Site Committees. On May 3, 1964, 330 new members were initiated. This number was the second largest to be initiated in the State. Our Charter indicates that we would be known as the Benevolent and Protective Order of Elks, Middlesex Lodge No. 2301. With approval of the Lodge, a building was purchased on the corner of Lincoln Boulevard and Madison. Meetings were held in that location until 1970 when land was purchased on Bound Brook Road and the present building erected. Middlesex is one of eight lodges in the West Central District within the State of New Jersey. Our first Exalted Ruler, Joseph Hoski, was a man of distinction, a person who would set the paradigm for his successors. Under his leadership, the Lodge was awarded the Grand Trophy for first place in the Best Overall Lodge in the State of New Jersey at the State Annual Convention. In 2003, Dunellen Lodge No. 1488, which was established on July 10th, 1924, had to abandon their Charter and, for the benefit of the Dunellen/Middlesex communities, it was determined that a merger was desirable. 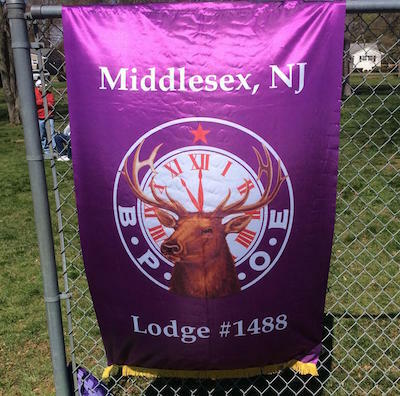 Thus, with the consent of the officers of the Middlesex and Dunellen Lodges, Middlesex acquired Dunellen Lodge’s Charter and their Lodge Number 1488. Grand Lodge approved this merger on February 13, 2003. For the last fifty years, the Middlesex Elks aspired to serve the community in a variety of ways. Today, we are regarded as the premier charitable fraternal organization in the Borough of Middlesex. We have been staunch advocates for special needs children, veterans, the youth, scouts of the Borough, and anyone in need. We pride ourselves in the countless volunteer hours spent on these efforts.